A pair of Red Patio Standard Roses for a summer long display of beautiful fragrant blooms. 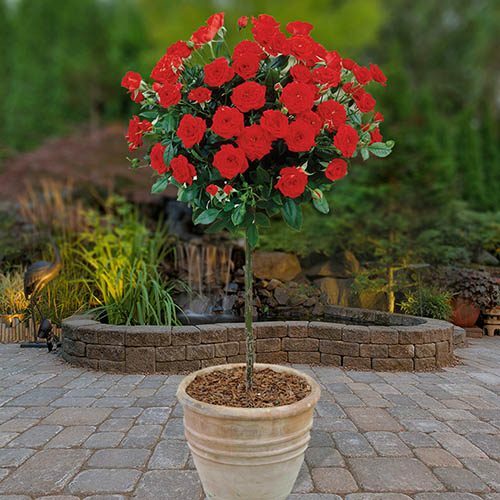 Also known as Tree Roses, they are the perfect way to add height and romantic style to your patio. Supplied as bare root plants, ready to be potted up or planted immediately upon receipt. There's nothing more iconic than a beautiful red rose in summer and these patio standard roses are AMAZING value for money at LESS THAN HALF normal nursery prices! These expertly grown standards will produce an abundant display of classic, fragrant blooms all summer long, filling the air with their perfume and adding colourful floral beauty to your garden for many years – a truly worthwhile investment. Also known as Tree Roses, they are the perfect way to add height and style to your patio, decking or balcony where a single bush makes a dramatic feature and a pair will dress a door or gateway to perfection. By carefully ‘top grafting’ the flowering variety onto a vigorous, straight stem of rootstock, our specialist growers have brought you a unique rose bush that will perform well in its first year, with guaranteed results. It takes 3 years to produces these gems – they are supplied as bare root bushes ready to be planted immediately upon receipt, supplied approx. 60-70cm tall with bushy heads.